My first diy 300b SET - found the schematic online and started to order parts...funny project and fantastic outcome. Well done! What is the operating point of your 300BXLS'es? I've made something similar many years ago, but that was with standard 300B tubes. And B+ or bias voltage if I may ask? (sorry for this "interrogation". Just trying to learn as much as possible). Nice! 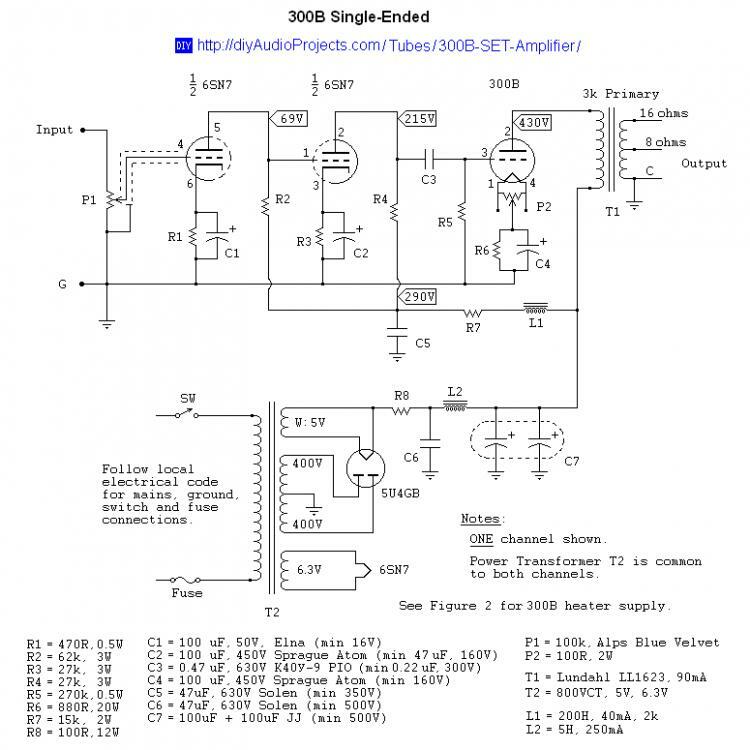 Can you just post the schematics here? If the operating point of the output tubes is 466V/80mA and bias is about 100V, I would guess that B+ is 566V with so called "auto" bias. The large silver cylinders on the PSU are the C7 caps. Solen 650VDC 100uf. Had to polish them for a week or two. Yes, get back to us. But be careful and don't electrocute yourself in the process. I hate to be the one responsible for that. The 300B needs a good driver that delivers enough clean voltage into the grid. But you will pay a price when the driver DC connects to the input stage. The price is that it burns away more than 70 volts in the cathode resistor (R3), voltage that the driver cannot exploit. If you look at the schematic, the max positive voltage swing from the driver stage before it runs into cutoff is equal to the voltage drop over R4 which is 290v-215v = 75v. That can limit the ability to drive the 300B into full tilt, due to the design of the driver.